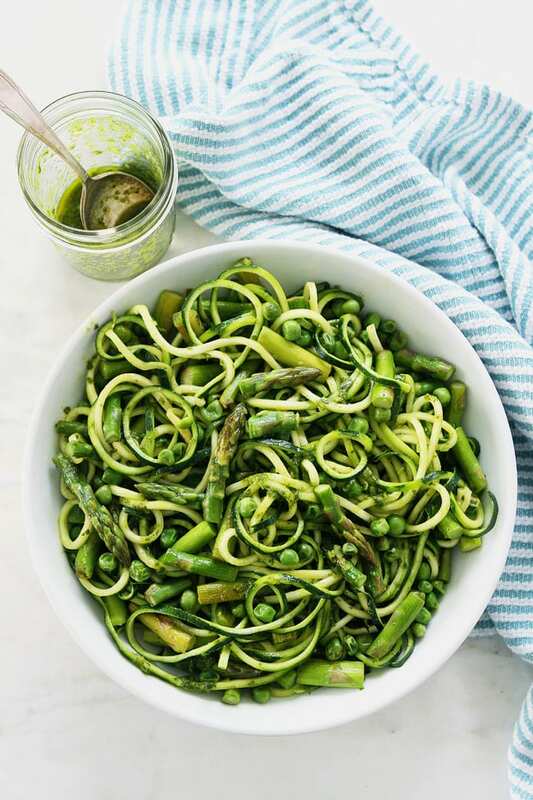 Zucchini Noodles with Asparagus, Peas, and Basil Vinaigrette is the perfect spring meal. It is light, refreshing, and super simple to make. I was in Austin earlier this week and I ate all the tacos, chips, salsa, and guacamole I could get my hands on. Gosh, I love that city. It was such a fun and delicious trip. I hope you followed along on Instagram. I love splurging when I travel, but it is always nice to get back home and back to healthy eating. To reset, I made Zucchini Noodles with Asparagus, Peas, and Basil Vinaigrette. 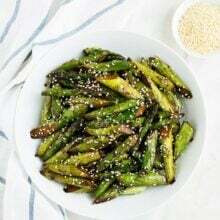 This is currently my favorite spring meal. I love everything about this simple spring recipe. First, the zucchini noodles. If you haven’t tried zucchini noodles, you need to. 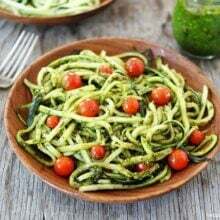 Zucchini noodles are a great way to get more veggies into your diet. Our boys love them too! They are fun to make and fun to eat. We use our Inspiralizer to make zoodles and we LOVE it! It is a great kitchen gadget to have. If you don’t have an Inspiralizer, you can still make zucchini noodles with a peeler, but it will take you more time. 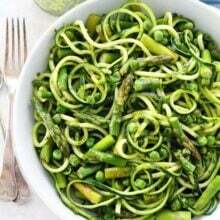 I also love the all of the green going on in this zucchini noodle dish. The asparagus and peas are the perfect addition to this spring dish. And now let’s talk about the best part, the basil vinaigrette. This basil vinaigrette is my absolute favorite and really makes this dish! It adds a TON of flavor and really brightens the dish. All of the ingredients combined scream spring and GREEN! I wasn’t sure if my boys would eat this one, but Caleb even had seconds. Josh and I did a major fist bump:) We love it when they eat their greens with no complaining..ha! 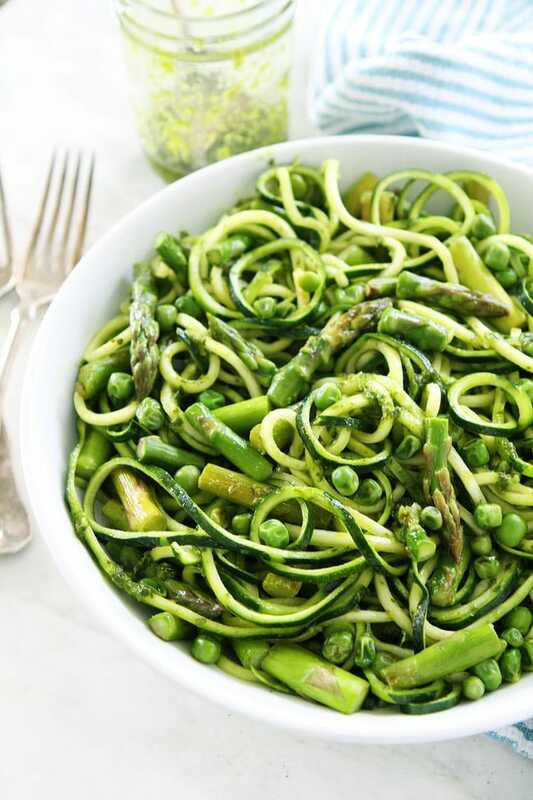 This gluten-free and vegan zucchini noodle dish is perfect for spring. It is light, fresh, and super simple to make. Spiralize the zucchini, according to manufacturer's instructions, and set aside. In a large skillet, heat the olive oil over medium-high heat. Add the asparagus and cook until tender, about 5 minutes. Stir in the peas and cook for 2 minutes. Add the zucchini noodles and cook for 1 minute, just so the noodles are warmed. You don't want to really cook them or they will get soggy. Remove from heat and pour the basil vinaigrette over the zucchini noodles. Toss with tongs until the noodles and vegetables are evenly coated. Season with salt and freshly ground black pepper, to taste. Serve immediately. 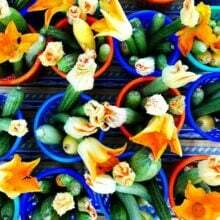 What an amazingly vibrant spring dish! This is so fresh and pretty Maria! It is like Spring in a bowl! This looks SO yummy! My littles are somewhat similar in ages to yours, but we’re not having so much luck with the veggies. Well, the older is a big fan of the reg/orange family and will eat carrots, red bell peppers, and tomatoes at every meal, but not so much on the green. 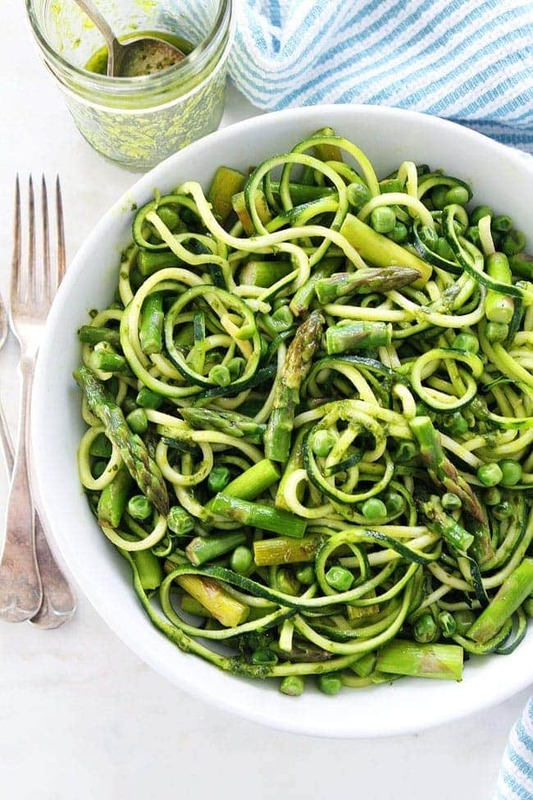 Maybe if we get her to help spiralize the zucchini…. In any case, whether they’ll eat it or not, I think this will be on our menu soon! That does look delicious! 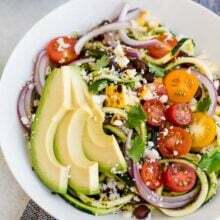 And thanks for the shout-out for one of my zucchini noodles recipes. Pinning yours now! Look at that luscious green! My, zucchini really sets the whole dish very rich, top it with basil which really makes it looks yum! But hey, do you think adding cucumbers makes it also worth it? By the way, though the color reminds me of St. Patrick’s, I’d love to make this one this coming Easter. Really something to look forward and I’m getting excited. Thanks for sharing this love. This looked great! What would you serve as a protein with this? How could so many greens look SO good?! Just made this, very good! Love the dressing! So great! Quick and tasty- made it exactly as directed, but halved the recipe. I also added shrimp!